Photographs by the author, taken of the plates in Davison (see bibliography), with thanks to the British Library. You may use these images without prior permission for any scholarly or educational purpose as long as you (1) credit the photographer and source (2) link your document to this URL or credit the Victorian Web in a print document. 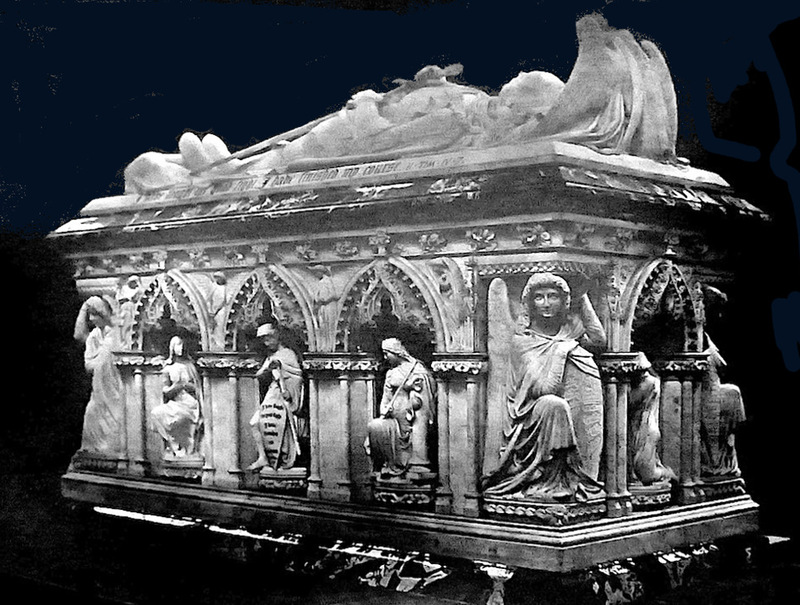 The tomb-chest and recumbent effigy, seen from the south-west. Cenotaph for Prince Albert with tomb-chest designed by George Gilbert Scott and sculptural work by Baron Henri de Triqueti (1803-74). Marble. Installed in 1873, in the Albert Memorial Chapel, St George's Chapel, Windsor. The nature of the memorial and its style had both been contentious, with proposals for, and indeed expectations of, a monumental statue of the Prince in uniform. 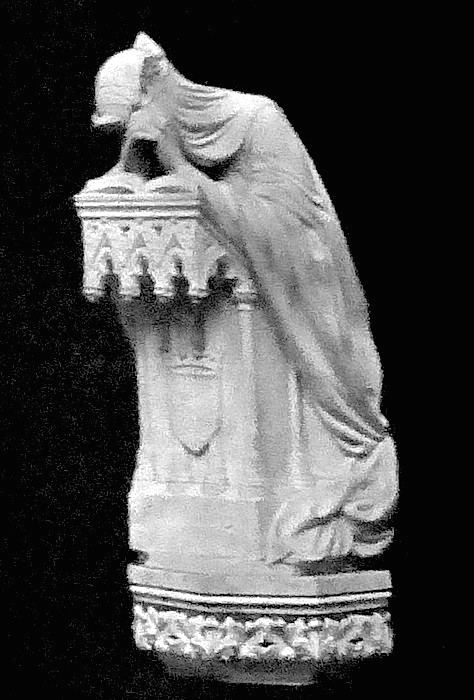 Eoin Martin writes that the sculptor "clashed repeatedly with Gilbert Scott, whose Gothic inspired framework he felt infringed upon his Italian-Renaissance inspired sculptural programme.... he struggled to accommodate a neo-Gothic cenotaph surmounted by what he felt to be an anachronistic medieval-style recumbent statue" (233). Even the medium was contentious, with Victoria's eldest child Vicky, now the Crown Princess of Prussia, expressing a wish that the effigy should be of "bronze adorned with silver and gold inlay" (Martin 235). Recumbent effigy of Prince Albert, from the north. Like many a medieval knight in effigy, Prince Albert is shown with his favourite dog Eos at his feet, looking up at him expectantly. It was apparently Triqueti's own decision to surround the effigy with words from St Paul's epistle to Timothy, which had been used earlier in medieval-style memorials of Albert (see Martin's discussion of this, 234): "I have fought a good fight, I have finished my course. II. Tim . IV. 7" — verse 8 starts confidently, "Henceforth there is laid up for me a crown of righteousness." Recumbent effigy of Prince Albert, from the south. Triqueti's achievement here has been admired, but not as much as Baron Marochetti's cenotaph in the Frogmore Mausoleum at Windsor, where the royal couple are actually buried. Of this cenotaph with its double effigy, Benedict Read says, "Less ornate than Triqueti's cenotaph, it has a massive, simple grandeur" (194). It is hard to compare the two at present, when there is no access to the mausoleum, but it is probably true that Triqueti was under too much pressure here to produce his finest or even his characteristic work. In particular, there is a problem of scale: the angels at the head seem too diminutive, even compared with the angels at the corners of the tomb-chest. More importantly, the figure itself is very rigid, no doubt partly because of the armour. There is no sense here of a once-sentient being, as there is in Triqueti's earlier effigy, of the young Duke of Orléns. Two figures in the niches of the tomb-chest. Left: Mourning Royalty. 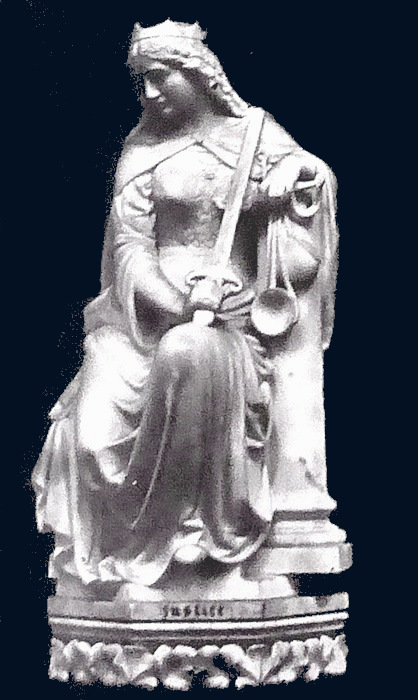 Right: Justice with her sword. There are eight small statues in the niches around the tomb-chest, as well as the larger figures of the angels at each angle. Along with two more angels (one with a sword, and one with a wreath) in the middle of either side, these are Mourning Royalty at the head of the tomb-chest, standing at a prie-Dieu with her face hidden, clearly representing the grief-stricken queen herself; Mourning Science at the other end of the tomb-chest, kneeling, again with his face hidden in grief; and Hope, Charity, Truth and Justice (see Martin 227 and Galliot-Rateau 27). Rather disappointingly, the two mourning figures with their undisclosed faces provide the most moving expression of feeling in this composition. Davison, Jane and Margaret. The Triqueti Marbles in the Albert Memorial Chapel, Windsor. A series of photographs executed by the Misses Davison. With a preface by Jane Davison (1876). Available at the British Library. General Reference Section 1762.d.3. Galliot-Rateau, Véronique. Henry de Triqueti, 1803-1874, Sculpteur: Collection du Musée des Beaux-Arts d'Orléans. Orléans: Musée des Beaux-Arts d'Orléans, 2009. Martin, Eoin. Queen Victoria, Prince Albert and the Patronage of Contemporary Sculpture in Victorian Britian, 1837-1900. Vol. I. Ph.D. thesis. Department of the History of Art, University of Warwick. Read, Bendedict. Victorian Sculpture. New Haven & London: Yale, 1982.